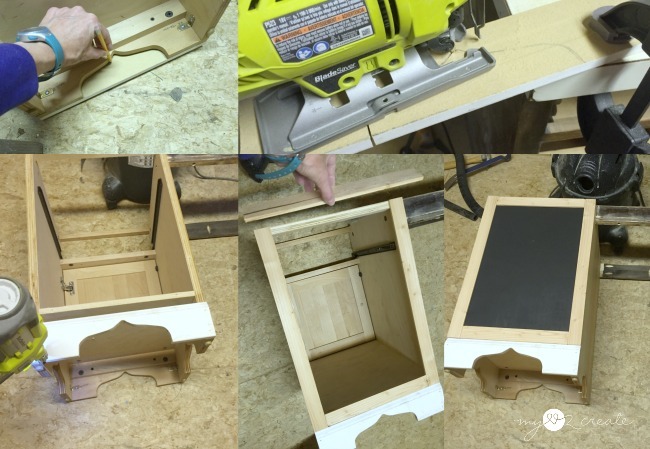 It is time for another Power Tool Challenge! As I said yesterday, in my DIY Hexagon Planters post, I have a "Sweet Treat" for you today! Super sweet right?! My kids are head over heels which was the goal, so that is a win in my book! 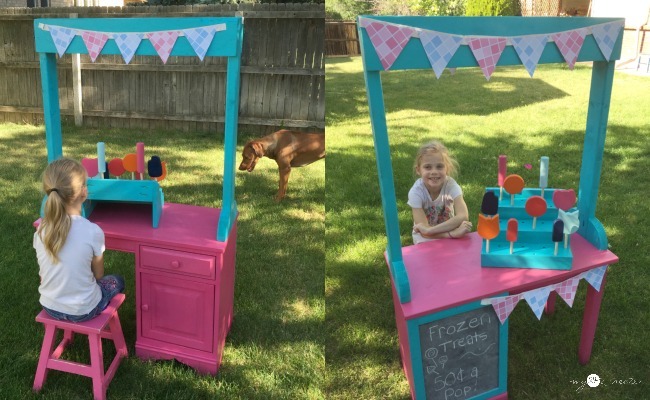 My daughter's birthday is this weekend and with a little sweet talking, she convinced me that a frozen treat stand would be a great addition, sort of like a present. So we set to work looking for the perfect candidates. We found this little wooden night stand on our back porch that I got years ago at a Garage sale, for $1 or $3, I can't remember which, and an old set of wooden table legs. My daughter helped me unscrew the back of the night stand and we also tried removing the top without breaking it, but obviously that didn't happen. Oops. She was very proud of her work. Gotta love that pose! 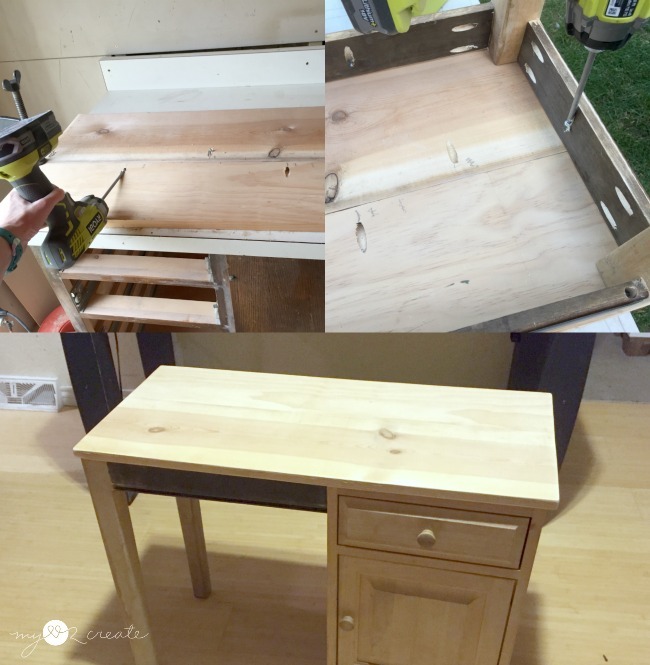 I cut the legs down to size for making an extension off the side of the night stand. Then measured them to make sure they were the right height. I grabbed a board to make sure, and placed it on top. Perfect. Next up, I found some old table aprons, they were left over from the table that my friend gave me that I used to help build my Kitchen Island with Pantry Storage. They were just what I needed, plus the cute detail on the edge was a bonus. 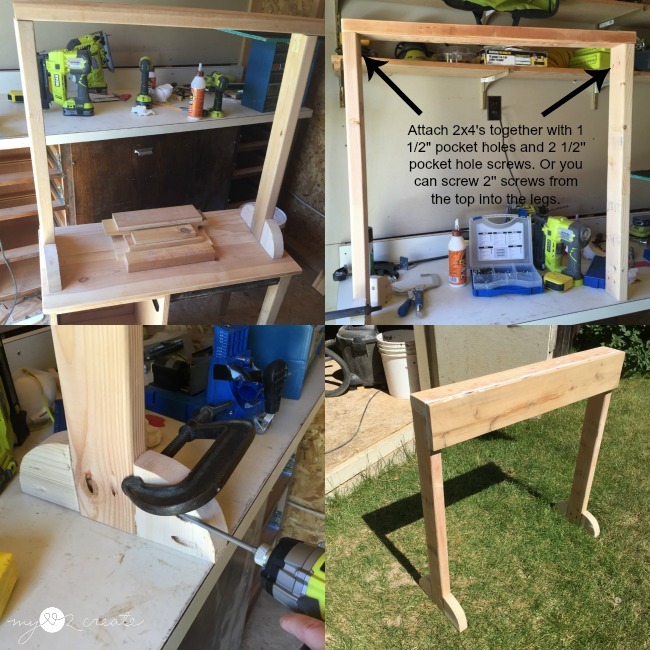 I drilled 3/4'' pocket holes with my Kreg K5 Pocket-Hole Jig and attached the two legs together with the short apron. I measured the depth of the night stand and subtracted the width of the two table legs to get the measurement for the short apron. I also drilled pocket holes into the front support piece, it had originally been screwed to the old top, and cut a back support piece and attached it with pocket holes as well. 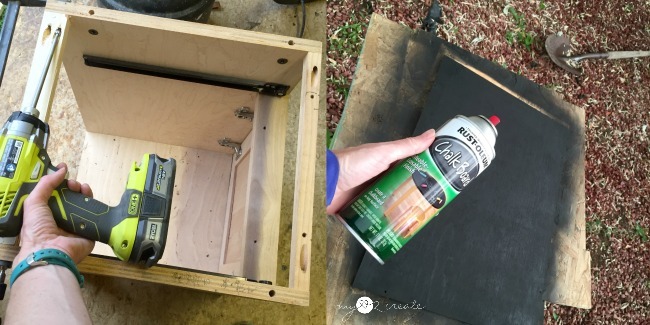 Then I sprayed the night stand backing my daughter had removed with chalkboard paint. I cut and drilled pocket holes for the long apron pieces for attaching the legs to the night stand. 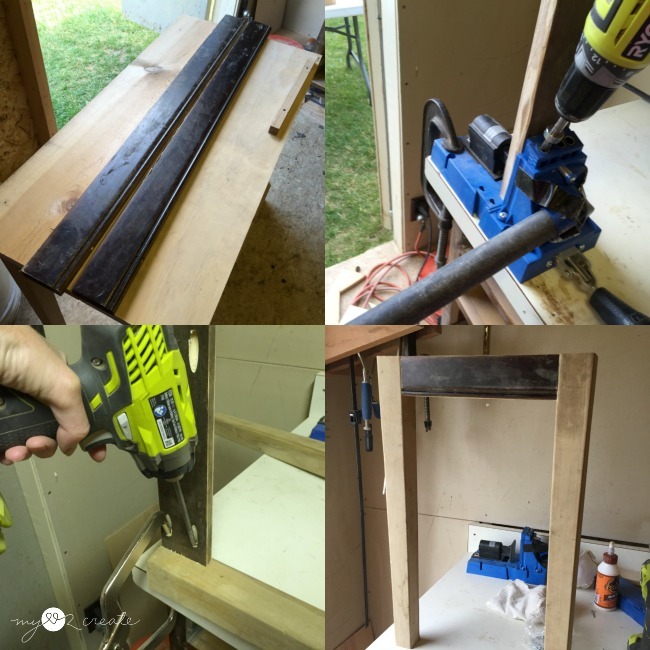 In the top left photo you can see I am using my handy Right Angle Clamp to help me out. I also remembered that I forgot to drill pocket holes into the apron so I could attach the top later on...so that is what I am doing in the top right photo. I found two scrap wood boards and cut them to fit the top. Then I attached them together with wood glue and pocket holes. With my pocket holes drilled into the apron it made it easy to attach the top (top right). On the night stand side I screwed into the top through the two top support pieces I added a few photos above. I thought it would be nice to add a matching piece to the back of the night stand. I grabbed a scrap piece of trim and traced the design on the back, then I cut it out with my jig saw. I glued and nailed it on. To trim out the chalkboard (the old night stand back piece that I painted) I found some left over lath strips and cut them to size. 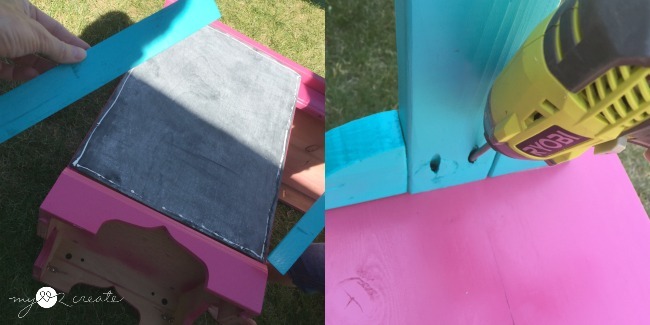 In the above photo I am doing dry fit with the chalkboard and trim. Every selling stand needs the sign part above it. Honestly I have no idea what this is called, although I think I should know...but it is escaping me at the moment. Anyway...I grabbed some scrap 2x4's and cut the legs to a size I thought was good, basically one that my kids could stand behind and still see out. The top piece was the same length as the table top. I attached the legs to the top with pocket hole screws and then I found these left over curved pieces from when I built my X Arbor with Bench. They were the cut outs from when I made my rafters, yes, I save everything...that is way I have so many scraps, and why I could build this for free! I attached them with pocket hole screws. Then I added the front piece with glue and finish nails, using a 1x6 scrap board. I eventually decided to add another piece to the back as well, but I did it later on. The truth is, I really let my kids help direct this project, I did most of the labor, but they had a hand in the design and of course the colors were totally up to them. When it was time to paint, and I pulled out a nice neutral white oops paint, but they weren't having it. They hurried to my spray paint stash and grabbed these cans. A compromise for the boys and girl...half blue and half pink (looks a little more pink to me, but I am not saying a word). I decided to just go with it, because after all it wasn't for me...and this is going to double as desk in my daughter's room so why not let her have her favorite color?! After everything was painted and dry, I glued on the chalkboard backing, and added glue for the trim and then nailed them on. 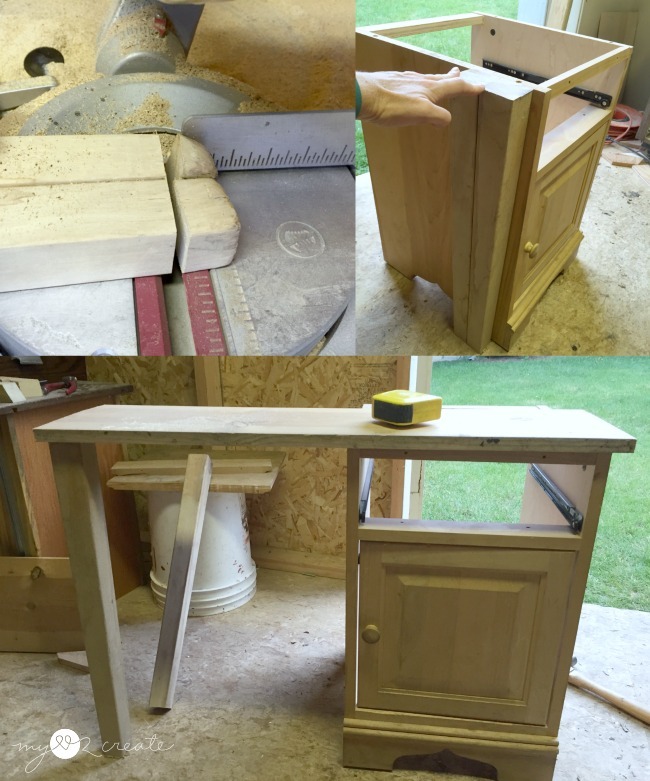 I attached the stand part to the desk top with the pocket holes I had drilled in the legs and that was it! I DID get all the treats cut, and sanded. Then we simply spray painted a few and threw them in the stand I designed and put together in a rush...and don't let those extra holes fool you. 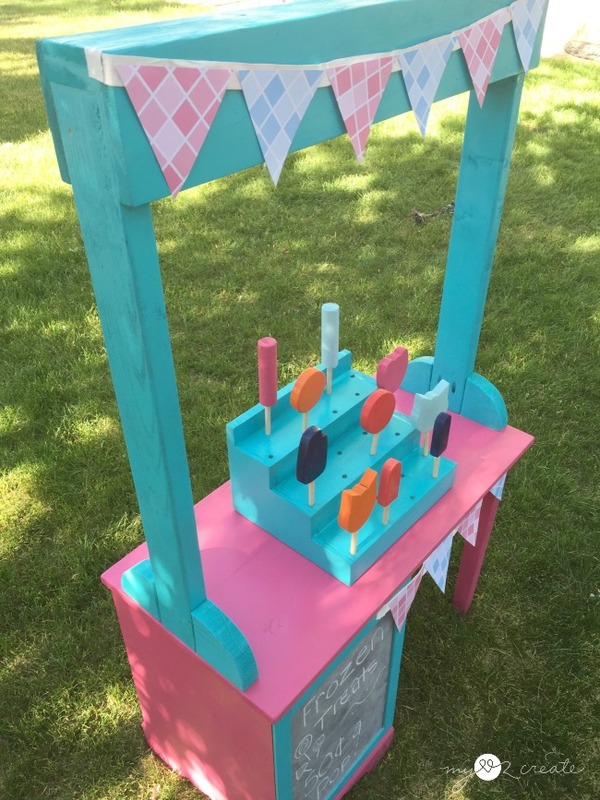 There are exactly 24 of them, and we have a frozen treat for each, plus four ice cream cones that obviously need a stand of their own...good grief! 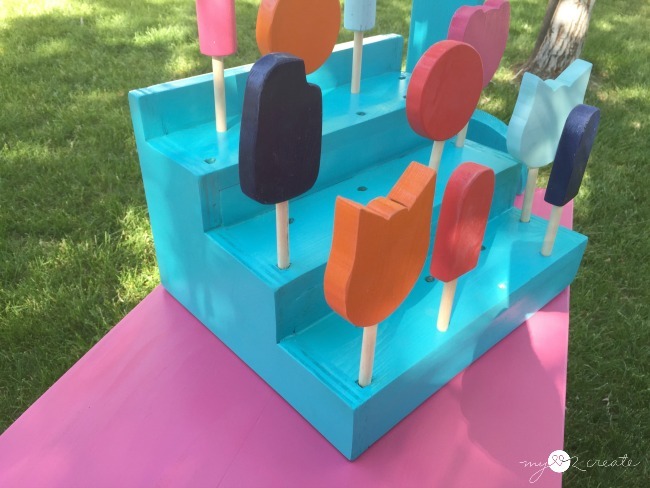 *Update- Check out how to make the DIY Frozen Treats! As for the "Frozen Treat" sign on the top...well I am working on that today too. :) For now I am really liking the cute paper bunting. I grabbed some scrapbook paper cut it into triangles on my Cricut Explore Air , and hot glued them to some scrap ribbon. Yes, I stuck it on with some white Gorilla Tape, it worked for the photos, but when I get the sign done I will probably stick it on with some tacks and maybe do fabric...we will see. Ready for playtime! In fact my kids we out here all evening playing, they had so much fun! You can see how the night stand front is still in tact. I am glad she can use it as a desk and then they can pull it out to play. Double whammy! 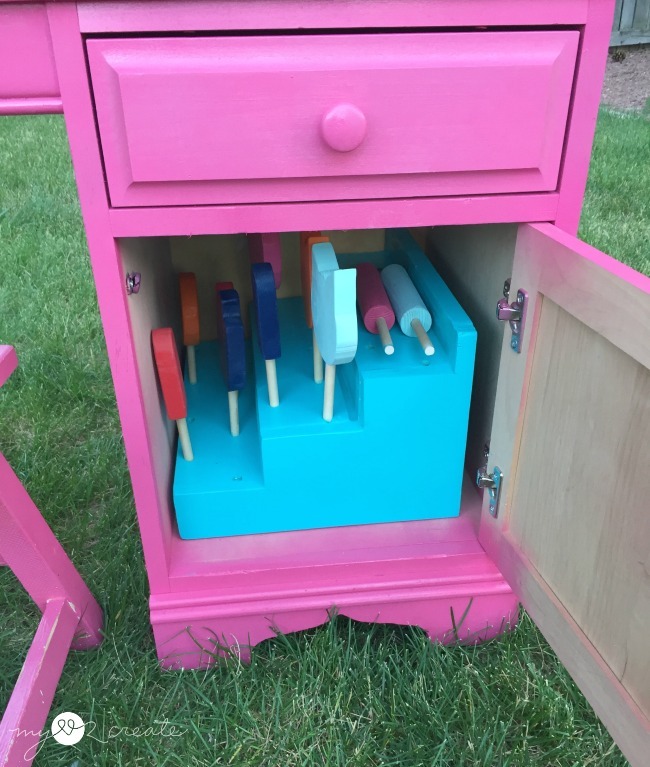 I even designed the frozen treat stand to fit inside the desk for when they want to put it away...bam! Today we are going to the dollar store, where my youngest is planning on spending his tooth fairy money that he got this week, when he lost his first tooth, to purchase some fake money to go into the drawer. See...they have been planning this all week, so cute. 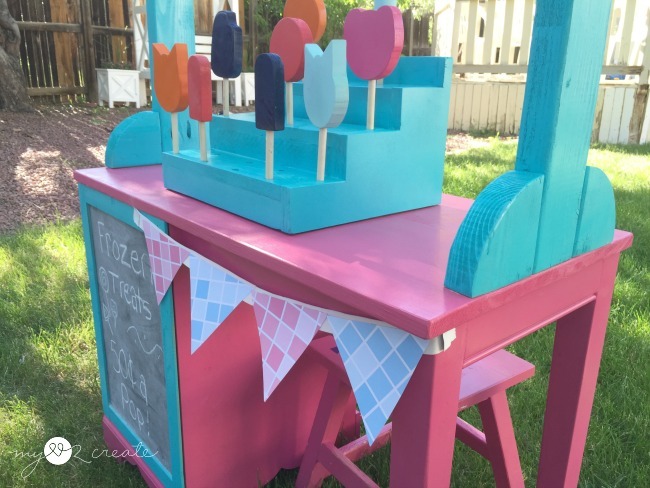 I am even loving the fun colors my kids picked, it is very cheerful, just like a frozen treat stand should be. 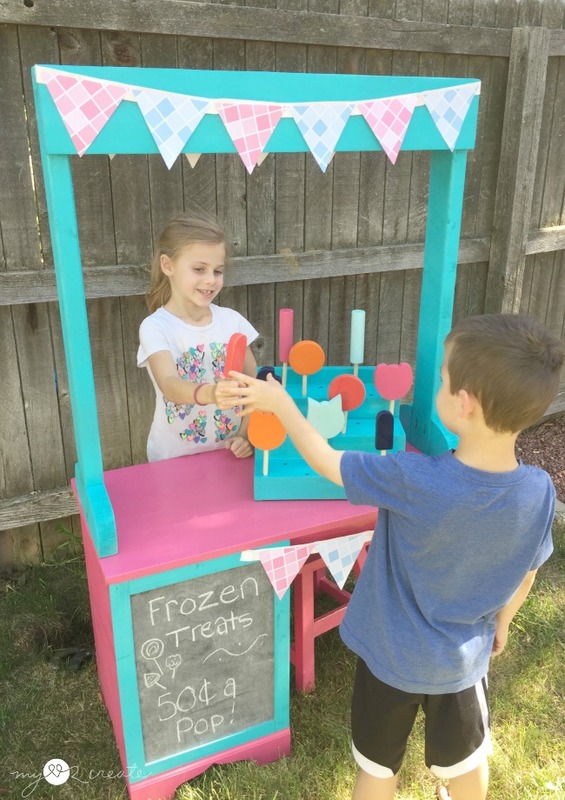 If they wanted, my kids could take it out to the street and actually sell real frozen treats or lemonade! But for now they are happy to just play together, and now I don't have to take them to the library to do it! 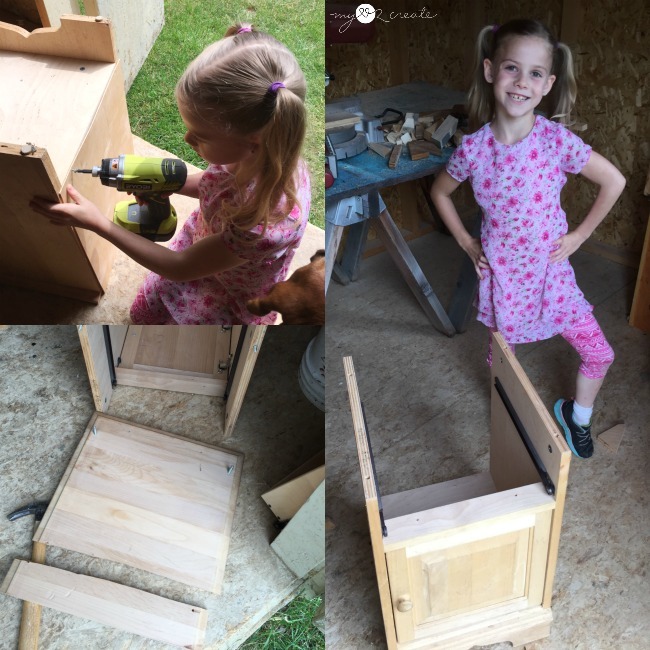 I am so glad this power tool challenge got me going on this project, and that it is making my kids so happy! 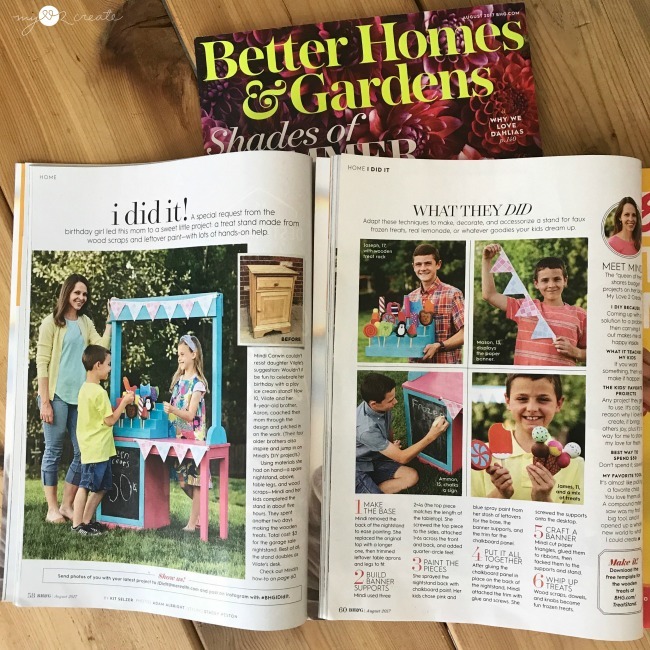 *Update* My project was featured in the Better Homes and Gardens Magazine in the August 2017 issue!! Can you believe it?!! 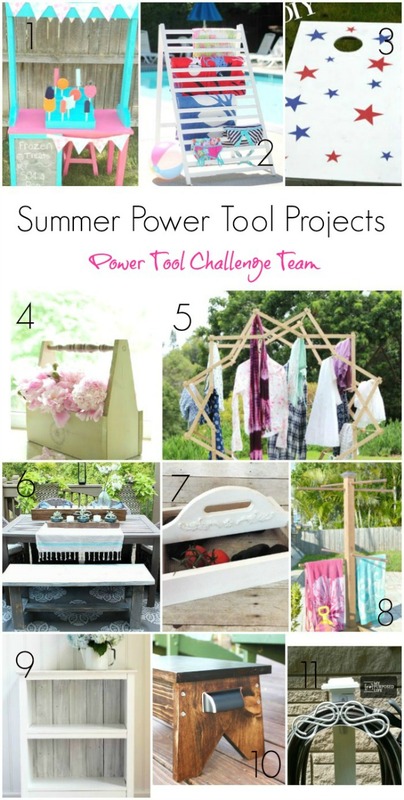 Speaking of the power tool challenge it is time to go check out all the other amazing summer projects! Woo hoo! I am loving them! Thanks for stopping by, and I hope you are inspired to do your own summer project! pinning for future reference for sure! Oh my gosh Mindi, this is absolutely adorable! 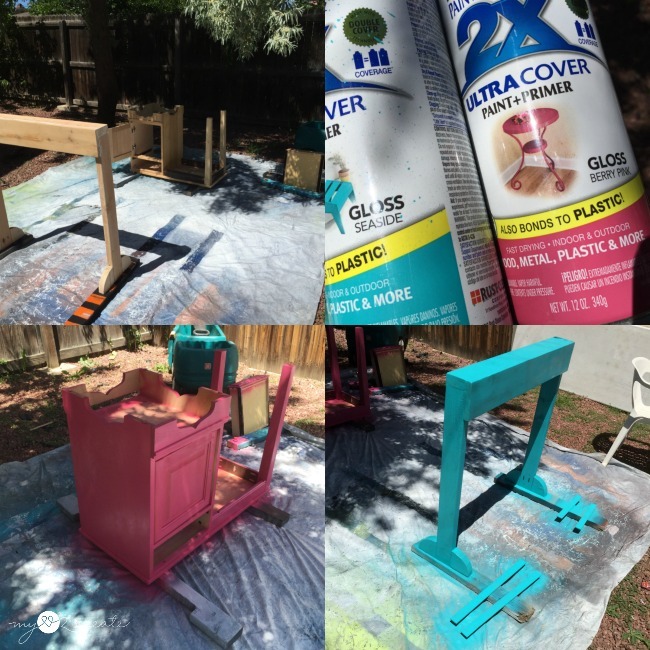 What lucky kids to have such a DIY savvy Mom and I bet the entire neighborhood of kids are hanging out at your house these days. Looking forward to seeing the rest of those treats! 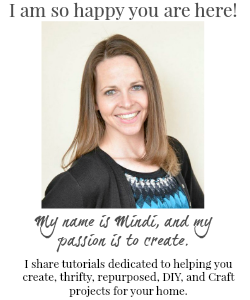 Oh, WOW, Mindi!! That is the most adorable stand! 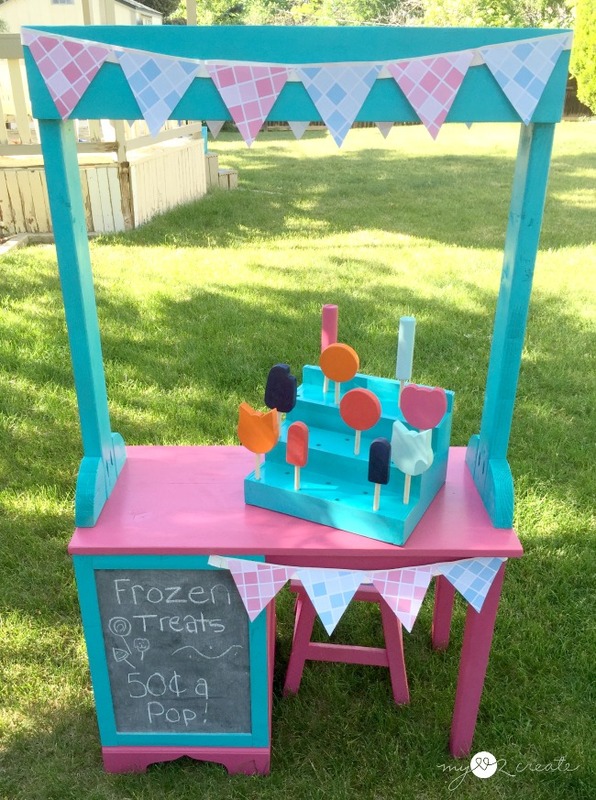 So clever and I love the million and one frozen treats, too! When my daughter (who is 17 years old) sees this, she will want one... Your little helpers are equally adorable, too! Oh my goodness! This is so, so cute!! I would have loved to have played with that when I was a child. I know your kids will enjoy using it all summer long. Amazing!! Love it Mindi - you are so talented!! I love this one! My kids would have loved this when they were little and my grandkids would love it now! Time to scour the thrift stores for a nightstand! Ok I guess I shouldn't be surprised that this morphed from a little nightstand...but I am. Mindi this is sooo cute! What a fun project. I'm sure your kids will have a great time playing with it. Thanks for sharing with SYC. How fun for pretend play! This could become so many different variations with a little child imagination! 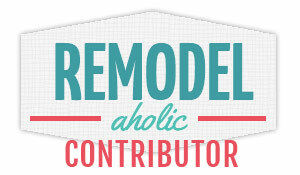 Hi Mindi, There's a post on my blog about the inspiration I got from this post the other day! It doesn't show the finished project, but I'll post again when it's done. Thanks again! Hi Mindi! I love, love, love this!! Girl you always have it going on. You'd be so proud of me. I just finished my first drill project! I might just have to make your project for the little ones as a gift. How fun!! 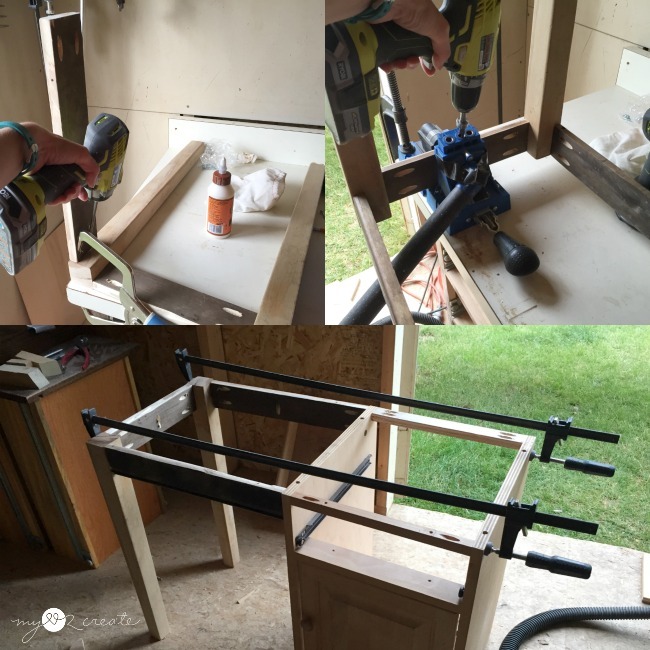 lol You can see it here>>http://www.dearcreatives.com/easy-diy-improvement-projects-towel-rack/ Thanks for sharing your DIY at the party. Happy Summer! !